Why this book? Other than the fact that I like writing about computers more than just about anything else, this book fills several real needs. No matter how many manuals a computer manufacturer puts out to accompany a syste- and some of Epson America’s are very good – not everything can be covered. This book fills in the gaps. This book is unbiased, having been written independently of Epson. So, I won’t be telling you to drop everything and run out to buy an HX-20. The HX- 20 is good for some uses, not so good for some others. This book is a guide to out of the machine and/or pointing you towards a different getting the most machine that might better suit your needs. At the start of this project I had to decide who was my target audience: novices, experts, or those in between? Because HX-20 owners and prospective owners don’t fall into neat categories, I tried to ‘cover all the bases’. Or at least as many as possible. As with any attempt to do everything, I didn’t always succeed. But I did succeed in providing at least something for everyone. 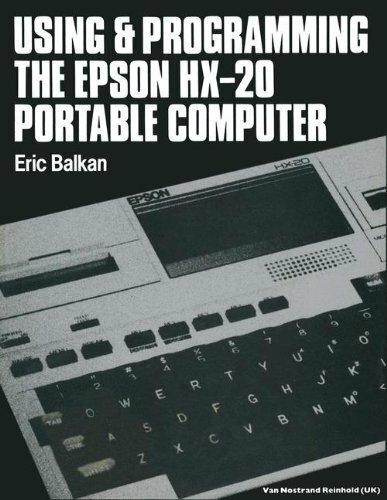 For those who haven’t yet bought a portable – or are unsure if buying an HX-20 was the right move – there are descriptions of 20 other portables on the market. For those who have used other computers before, there’s information on how Epson BASIC differs from other BASICs, with tips on converting programs.